The “most dangerous man in America” is now 86 years old and lives in a modest mid-century house in Kensington, a stone’s throw from Berkeley. Daniel Ellsberg achieved notoriety when he released the Pentagon Papers (depicted in Steven Spielberg’s movie The Post), and helped bring about the resignation of President Richard Nixon and the end of the Vietnam War. His objective all along, however, was to release then-classified information about what he considers the “omnicidal” nature of nuclear weapons, and the genocide that would result from their use by either the U.S. or Russia. It has taken him almost 50 years, and dozens of rejections from numerous publishers, but he has finally succeeded in publishing The Doomsday Machine: Confessions of a Nuclear War Planner. While the book contract was signed before Donald Trump was elected president, the conflict between Trump and North Korean president Kim Jong-Un made the topic — which elicited only yawns before — seem suddenly timely. And the nuclear attack warning mistakenly issued in Hawaii a couple of weeks ago only brought the subject closer to home. “I have known for 60 years now how dangerous the situation is. It was a big secret I had to live with,” Ellsberg said, sitting at his dining room table, with views of fittingly gray skies looming over the Bay. “People are living in denial about the possibility of nuclear war. They are living in denial because they are lied to by the government as to what the risks are, and what the scale of destruction would be.” People are in as much denial about nuclear war as the Republican Party is about man-made climate change, he added. The chance of us “getting through another century is small, maybe 1 or 2%,” Ellsberg warned. While he has no illusions, he hopes his book might double our chances (raising them to a full 4% or so) by bringing activism and attention to this danger. The Titanic was not doomed to sink, he explained: as it turns out, many other ships were in those same icy waters on that same dark night. But other captains made different choices regarding the route, and they managed to arrive home safely. Ellsberg is spending almost every waking moment trying to wake people up to the dangers ahead, and to motivate them to demand a change of course. He doesn’t claim it will be easy, and points out that Democrats have been as tone-deaf to this issue as the Republicans over the decades. 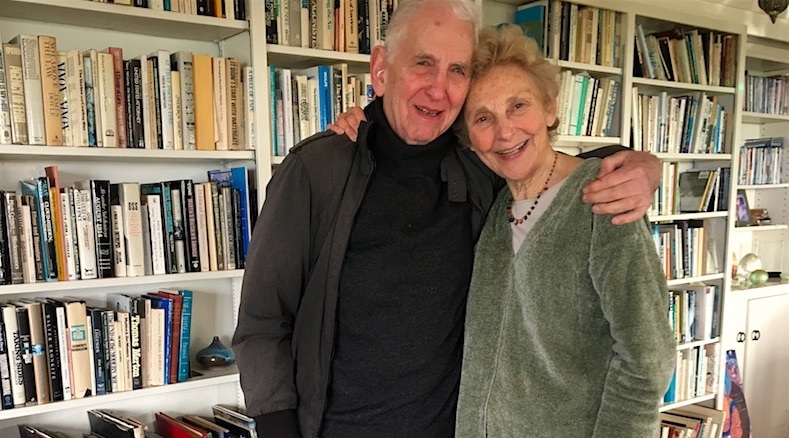 Ellsberg and his wife Patricia — who has been an active partner in his work — are hoping that because of the extra dangers posed by Trump and North Korea, a kind of #MeToo movement might coalesce around the nuclear issue. Patricia added that she hopes this will become a women’s issue, too. Patricia said she and her husband would like to connect with all the candidates running for office in the next election, many of whom are women, and raise this as one of the key election issues in 2018 and 2020. Ellsberg should know. He used to be one of those analysts, first at the RAND Corporation, then at the Pentagon and even the White House. He worked closely with Secretary of Defense Robert McNamara (who worked under presidents Kennedy and Johnson), and Nixon’s Secretary of State Henry Kissinger. The answer that came back shocked Ellsberg: 600 million people would die from a U.S. first strike. That would mean 100 Holocausts. That was the motivation for copying 7,000 pages of classified documents now known as the Pentagon Papers. Ellsberg released selected documents related to the Vietnam War first, because he felt that ending that war was a more immediate life-saving measure. His intention was always to publish materials related to the nuclear danger soon afterward. But things did not go according to plan. The Pentagon Papers were supposed to be just the appetizer, but things very quickly got out of control. The papers were “just history,” said Patricia, who said she had urged her husband to stop complaining and start making copies after he showed her some documents. Patricia is Ellsberg’s second wife, and they got married in 1970. So they were still newlyweds when Patricia began cutting “Top Secret” stamps off thousands of pages, for hours on end, because copy shops wouldn’t copy the documents otherwise. She took small batches to different copy shops in Cambridge, so as not to arouse suspicion by copying everything at once. Ellsberg had tried to persuade Sen. William Fullbright to publish or hold Congressional hearings on the Papers, and had also asked Sen. George McGovern to put them in the Congressional Record. Both refused, probably out of fear for their political careers, Patricia said. So Ellsberg decided to take the risk on himself. “Nixon had no problem with my making Democratic administrations look bad,” Ellsberg said. But Nixon actually had secret plans to use nuclear weapons in North Vietnam, and he was afraid Ellsberg might release those plans. As it turns out, Ellsberg didn’t find out about those nuclear plans until years later. He writes in The Doomsday Machine, “Henry Kissinger’s fear that I did know about Nixon’s nuclear threats and plans, and might have documents to back it up, was sufficient reason for him to regard me as ‘the most dangerous man in America’ who ‘must be stopped at all costs’.” It was that fear — the fear that Ellsberg would reveal “documents from the Nixon administration, beyond the period of the Pentagon Papers — that led to Nixon’s resignation facing impeachment, making the war endable nine months later,” he wrote. There were several reasons those further documents —which would have revealed America’s first-strike plans and their attendant costs in human life — were not revealed. First, since Nixon had Ellsberg indicted on espionage charges, Ellsberg was busy fighting a court case (which was ultimately dismissed) for three years. During that time, he couldn’t hold onto the documents, because he was afraid the FBI would seize them. So he gave them to his brother to keep. His brother, also afraid of FBI seizure, came up with the idea of hiding those papers where they would indeed never be found: in a cliff overhanging a garbage dump. The papers were in a box covered by a plastic bag, hidden under a green metal stove to mark the spot. However, a hurricane collapsed the cliff soon afterward and the stove slipped off the cliff. Despite repeated searches by his brother and their friends, those documents disappeared forever. But as those documents were declassified over time, Ellsberg still found himself unable to write a book about America’s nuclear arsenal and first-strike plans. That’s because he had a serious problem: writer’s block. It turns out that this is the problem that led Ellsberg to consult a psychoanalyst 50 years ago. And again, Nixon’s fears transformed those benign consultations into a now-famous piece of the Watergate scandal. That didn’t stop Nixon’s plumbers from breaking into Ellsberg’s psychiatrist’s office, though, looking for dirt. “Nixon was looking for stuff to blackmail me with, stuff he hoped I had confessed to,” Ellsberg said. “Back then, I think they hoped to find I was a homosexual, or had lurid dreams.” It was reported that nothing was found, but Ellsberg said his psychiatrist found his file open on top of the filing cabinet. Its contents were probably photographed, and must have created much disappointment for the Nixon crowd. That filing cabinet is now in the Smithsonian. Ellsberg said the The Doomsday Machine had to be “pulled out of” him by his family. While Ellsberg may have had writer’s block, he is a prodigious collector of information. His basement is filled with hundreds of boxes and thousands of painstakingly collected files about Vietnam, nuclear policy, government lies, and much more. And 30 years later, those files are still there, stacked haphazardly in every nook and cranny of the long and narrow basement. They are currently being archived by the nonprofit Internet Archive, in a process that will take months. It was because of Patricia that Ellsberg moved to the Bay Area from the East Coast. “After the trial, which ended in 1973, I realized that Patricia had been living my life since we got married in 1970. I told her that when it was all over, we could go wherever she wanted. She wanted to come here to work on a PhD on transpersonal psychology.” The couple moved first to San Francisco and then to Kensington when Patricia was pregnant with their first child. They have lived in the same house — which would be called a rambler on the East Coast — for the past 40 years. After decades of activism and countless protests against nuclear proliferation, including more than 70 arrests, Ellsberg is still speaking truth to power. He is still vibrant and passionate, bounding up and down the outside steps to his basement office. He says he missed celebrating his 85th and 86th birthdays, because he was too busy working on the book. He is hoping to celebrate his 87th birthday, coming up this spring, in relative peace and quiet. Even though it was rejected by 17 publishers, The Doomsday Machine is now in its fifth printing only six weeks after publication. There are now 30,000 copies out there, Ellsberg said, and he is still fielding interview requests multiple times a day. He received a call from Japan during the interview with Berkeleyside. She clearly didn’t know about Daniel Ellsberg’s persistence.